Maestro explores the genius life and personality of Arturo Toscanini (John Noble) one of the greatest conductors of the 20th century. 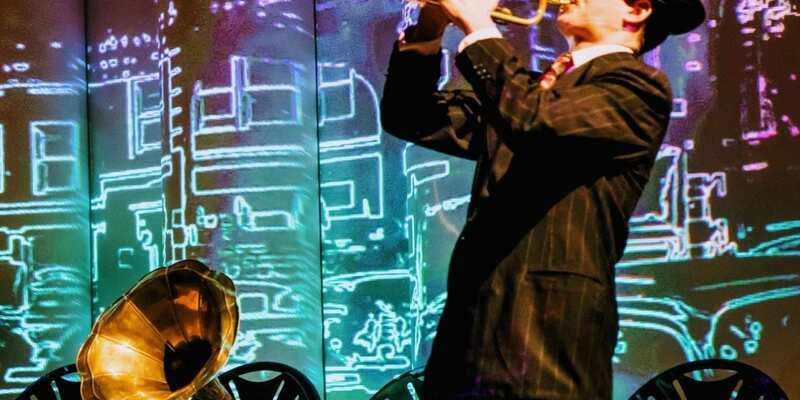 A music lovers’ delight, the play uses world class musicians, visual art and narrative to explore the Maestro’s life in an anachronistic sequence that exemplifies his interactions and views on the regimes of Hitler and Mussolini, love and artistry. Like many geniuses his lifelong passion for perfection and the accolades he received seem incongruent. He feels that he can never achieve that for which he is striving. The scenes are cleverly designed to follow the world-renowned conductor. Like many artists he suffered from unrequited love and fell short of attaining his self-imposed standard of perfection. Striking is his commitment to humans and his rejection of Fascist policies. He openly criticized both Mussolini and Hitler. The string quartet (Mari Lee, Henry Wang, Matthew Cohen, Ari Evan), trumpeter(Maximillian Morel), pianist (Zhenni Li) utilized in the play effectively conveyed musically the Maestro’s passion and suffering. Visual representations of world history are brilliantly incorporated into Toscanini’s own letters. The Maestro’s passion for music is encapsulated in every nuance of the play. The only two composers played that are not Italian are Richard Wagner and George Gershwin. The producer used original recordings of Toscanini’s orchestra and soundtracks from Studio 8-H Rockefeller Center, New York City with the NBC Symphony Orchestra. The performance of Richard Wagner’s Liebestod, from Tristan und Isolde work is particularly significant because it portrays Toscanini’s emotional state at the time of his own blossoming love affair with the young Italian pianist Ada Mainardi at its onset. Mainardi was the same age as Toscini’s own daughter at the time. Wagner’s leitmotif technique used in Liebestod is analogous to the themes of Toscanini’s love for Mainardi that emerge in his lifelong psyche. Like Wagner’s preoccupation with Gesamtkuntswerk the Maestro ensures every aspect is apposite to his aesthetic vision for the orchestra he conducts. The visual work used was of the period – dreamscapes reminiscent of Dali’s work, to portray the night of broken glass and concentration camps. As Maestro was considered one of the greatest conductors of opera and is famed for his work at La Scala and The New York Philharmonic it is not a surprise that much of the expressive meaning used in the play is conveyed through a multi-media experience. Operas were the first multi-media experiences for people using multiple art forms; music, dance, visual art settings, narrative and dialogue. In this production the Ensemble for the Romantic Century conjures the past with original multimedia productions that fuse chamber music, drama, and history. Illuminating the interplay between literature, biography and music they have transformed the play/concert experience. The play brings to life the heroic defiance Toscanini held against Fascism. He refused to perform in Italy and Germany. He flew to Palestine to conduct an orchestra made up of Jewish refugees at his own expense and made headlines around the world. When Mussolini took his passport there was world-wide outcry. Maestro reminds us the power we all have, and the difference an individual can make. A voice can be heard. Maestro – Playwright, Founder of Ensemble for the Romantic Century, Executive Artistic Director, Eve Wolf. WITH: John Noble (Arturo Toscanini), Mari Lee (violin), Henry Wang (violin), Matthew Cohen (viola), Ari Evan (cello), Zhenni Li (piano), and Maximilian Morel (trumpet). Directed by and director of theatrical productions Donald T. Sanders; co-artistic director, Max Barros; musicologist, James Melo; scenic & costume design by Vanessa James; lighting design by Beverly Edmonds and Sebastian Adamo; projection design by David Bengali; sound design by Bill Toles; casting by Geoff Josselson, CSA; general press representatives David Gersten and associates; advertising and marketing DR Advertising; archival consultant Renée Silverman; special consultant Harvey Sachs; production coordinator, Jeremy Scott Blaustein; general management, Aaron Grant Theatrical; production manager, Red Bird Entertainment; company manager, Matthew McVey-Lee; production stage manager, Paul Blakenship; associate stage manager, Liz Haroian; company manager, Austin Tracy. Tickets for MAESTRO, which are now on sale, are $39 to $149 and can be purchased online at Dukeon42.org; by phone at 646-223-3010; or in person at The Duke on 42nd Street at 229 West 42nd Street (Tuesdays-Fridays 4-7 and Saturdays 12-6). Beginning performances Thursday January 3rd. Opening Night is set for January 14th. This limited Off-Broadway engagement runs through February 9th only. At The Duke on 42nd Street (229 West 42nd Street, between 7th and 8th Avenues second floor). For more information, visit romanticcentury.org.Running Time: 2 hours with a 15 minute intermission.